The Harvard University Aeronautical Society was established in November of 1909 with 250 charter members. 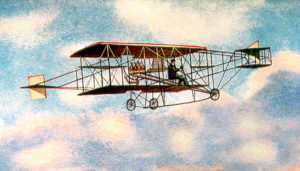 In 1910 the society constructed its own airplane, a Curtiss style biplane called the “Harvard 1”. It was the first airplane to be owned by any college or university in America. The following newspaper article appeared in The Caucasian, (Shreveport, La. ), on January 25, 1910. All the materials and accessories necessary to the construction of a first class, full size aeroplane have been ordered by the Harvard University Aeronautical Society. J. V. Martin, director of the organization, has been authorized to make such purchases as he may deem necessary to build a two passenger biplane. Plans of the machine have already been completed. When it comes time to manufacture the various parts needed in the construction of the aeroplane the work will be done by undergraduates in the Harvard engineering and scientific departments, and the assembling of the machine will also be under their charge. By June of 1910 the Harvard 1 was ready for testing. The following article appeared in The Bridgeport Evening Farmer, (Bridgeport, Ct.), on June 14, 1910. Boston, June 14 – Harvard’s new aeroplane, the first flying machine owned by any college in America, went for the first time under its own power in a series of engine testing feats on Soldiers Field today. The Harvard I, as it has named, did not leave the ground, and the attempt to fly will not be made until tomorrow morning, when if the weather is propitious, the machine will have further tests. In the trials this morning the aeroplane simply covered the length of the field four times on the rubber-tired wheels with which it is equipped for starting purposes. The engine proved able to drive the propeller at 1,200 revolutions per minute and to develop in the propeller a thrust of 190 pounds. The aeroplane developed speed quicker than an automobile and within 100 yards was going at about 20 miles per hour. The following article appeared in The Washington Times, (Washington D.C.), on July 11, 1910. Boston, July 11 – Harvard aeroplane No. 1 made two fairly successful flights on Soldiers Field today. In the first the machine traveled fifty yards. Fifteen minutes later the machine went an estimated distance of 150 yards. During the first flight an altitude of four or five feet was attained and in the second flight about eight feet. When descending from the second flight the machine landed on the left rear wheel, breaking it and disabling the machine for further use today. It was operated by J. B. martin. the Harvard Aeronautical Association has announced that it will build another machine of the passenger-carrying type. The following article appeared in The Bridgeport Evening Farmer, (Bridgeport, Ct.), on July 12, 1910, page 4. Boston, Mass., July 12 – Harvard aeronauts today are busily engaged patching up their aeroplane Harvard I which has again been smashed after twice getting off the ground in the first flights of its erratic career. In the latest attempt the flier covered 100 yards at about five to eight feet from the ground. The was preceded by a trip of 50 yards. As the ship was making good speed towards the bleechers it collapsed, landing on the left rear wheel and straining a wire. In a subsequently attempted flight, this wire snapped. The Harvard Aeronautical Club proposes to begin working on a passenger ship within a week. The latter craft, together with the Harvard I, will compete in the aero meet this coming September at the stadium. The following article appeared in the New York Tribune, August 27, 1910, page 4. Boston, Aug. 26 – The two flying machines now assembled on the aviation field at Atlantic, where, from September 3 to 13, is to be held the Harvard-Boston Aero Meet, were almost carried off to-day by a gale of wind during a heavy rainstorm. The machines – the Harvard I aeroplane and the Pfitzner monoplane – were stripped clear of the their covering, and the monoplane lost its wings. H. F. Kearney, an aviator, of Missouri, who is to fly the Pfitzner monoplane, had expected to make his first flight on the Atlantic field to-day, but the storm forced him to abandon the attempt. Cromwell Dixon, in his dirigible airship, declares that on Tuesday he is going to try to fly from Boston to Plymouth, more than forty miles, landing as near Plymouth Rock as possible. later he intends to retrace Paul revere’s historic ride through Middlesex County towns , to circle Bunker Hill Monument and to maneuver over the navy yard at Charlestown and over vessels in the harbor, dropping imitation bombs. The Pacific Commercial Advertiser, “Harvard Men To Build Biplane”, February 26, 1910, page 6.